UltraBoard Mount Peel N’ Stick is a premium pressure-sensitive mounting substrate designed for framed art and photographic applications. 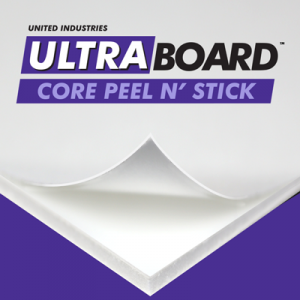 UltraBoard Mount Peel N’ Stick features a heavy and dense polystyrene foam core surrounded by 18 pt. polyethylene coated paper liners that prevent warping. One side features an acrylic adhesive pre-coating. Available options of black or white, 3/16 or 1/2 inches thick, and 10 pre-cut sizes. UltraBoard Mount Peel N’ Stick is a premium pressure-sensitive mounting substrate designed for framed art and photographic mounting applications. 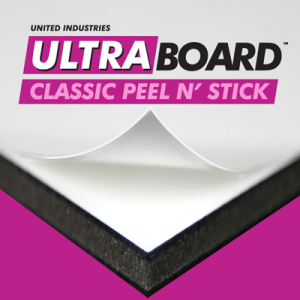 UltraBoard Mount Peel N’ Stick features a heavy and dense polystyrene foam core surrounded by 18 pt. polyethylene coated paper liners that prevent warping. One side features an acrylic adhesive pre-coating. Available options of black or white, 3/16 or 1/2 inches thick, and 10 pre-cut sizes. 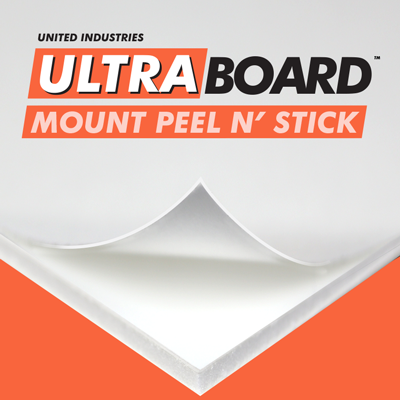 UltraBoard Mount Peel N’ Stick panels are available either trimmed or untrimmed.